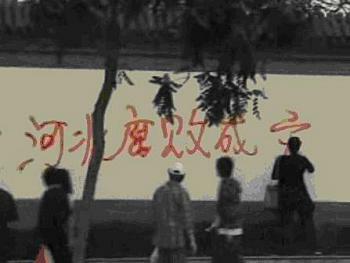 On April 30, 2009, Zhao Chunhong, a pregnant petitioner from Hebei Province, spray-painted anti-corruption slogans at a tourist spot in Beijing. Besides spray-painting slogans, she threw out fliers and held up a banner. This is the second time in April she has demonstrated her frustration. An eye witness told The Epoch Times, "Zhao's actions drew the attention of many passersby. Not long after, three police cars, several police motorcycles, and a dozen police officers came to stop her. The crowds defended Zhao and blamed the corruption for her case of injustice." Seeing pregnant Zhao work laboriously, a migrant worker who cleaned streets for a living, helped Zhao to hold up her banner. His act brought him a beating from the police. Later, the two were taken to the local police station and interrogated. The young man was released that same day at 11 p.m. The police threaten to detain Zhao for five days for disturbing public order, however, her detention was waived because of her pregnancy. She was released at 2 a.m. on May 1. A witness said, "Zhao wrote very quickly on the walls, 'Corruption in Hebei is disastrous,' 'Rascals in Zhuhai robbed property of disabled soldiers,' 'Kill corrupt officials, the source of corruption!' She soon threw out a thousand fliers. Her paper hat had 'Give me my human rights' written on it." Zhao is from Hebei Province. She began a business when she was 24, and spent nearly one million yuan (US$146,362) to partner with a local to develop the Qinglong Xigou Copper Mine in Qinglong County. Later the copper mine, worth tens of millions of yuan, was taken from her by the local regime. She had come to Beijing many times to protest against corruption with fliers and banners. Read this article in Chinese.